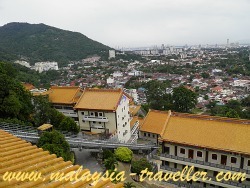 Penang's Kek Lok Si Buddhist Temple is located atAir Itam on a hillside offering fine views overlooking George Town. You could say it has been 130 years in the making as construction began in 1886 and has continued ever since. It was established by an abbot from Foochow in Fujian province, China. Over the years it has been expanded, upgraded and improved and even today, work is still going on in parts of the sprawling temple complex. The Buddhist community in Penang has always been wealthy and generous when it comes to providing funds for construction and the temple management's commercial skills have found clever ways to obtain revenue from the hordes of tourists and devotees who visit annually. There are numerous shops scattered around the grounds selling souvenirs, gifts, refreshments and religious paraphernalia. This degree of commercialisation, together with the presence of multitudes of tourists snapping photos, can give the temple the feel of a Buddhism Theme Park rather than a place of worship. However we did see monks performing prayers during our visit so this is definitely a working temple and certainly the splendid halls and shrines are steeped in spirituality if you can ignore the crowds. The name Kek Lok Si by the way is Hokkien for Temple of Heavenly Bliss so it must be possible to find some bliss here. 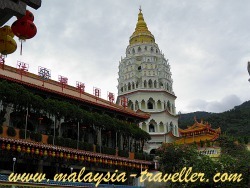 The star attraction is the seven storey Pagoda of 10,000 Buddhas which was completed in 1930. Its foundation stone was laid by the then King of Siam (Thailand) Rama VI and the architecture of the pagoda incorporates Thai, Chinese and Burmese elements in its design. The other big attraction is a giant bronze statue of Kuan Yin (The Goddess of Mercy) in front of which is an open area to admire the view of Air Itam and George Town. There are also landscaped gardens with carp and tortoise ponds at this level. The statue is 30 meters high and was completed in 2002. 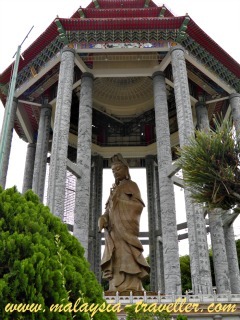 Since then they have added a pavilion with an octagonal roof supported by tall columns to protect the statue from the elements. The pavilion was mostly finished in 2009 but, as at December 2011, was still shrouded in scaffolding to enable further embellishments to be carried out. To reach the Kuan Yin statue from the main temple level we travelled by the so-called 'Inclined Lift' which is a kind of short funicular railway. The lift passes two large ornately decorated dormitory blocks, presumably for monks. TIP It is better to get a return ticket on the Inclined Lift. If you try walking back down you end up exiting the temple altogether. There is a vegetarian restaurant in the basement level of the complex. In nearby Air Itam there are plenty of simple restaurants and food stalls if veggie is not your thing! 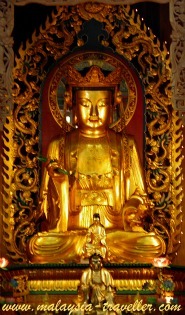 The temple is open daily from 9am to 6pm. Kek Lok Si looks its best at Chinese New Year when the whole complex is decked with thousands of coloured lights and lanterns. The lights usually run from 7pm for the first 30 or so days after Chinese New Year's Day. During this period the temple stays open late at night (until 10pm or, some days, midnight). Be prepared for big crowds if you come at this time of year. Admission to the temple is free but there is a RM2 entry charge for the Pagoda (kids under 13 pay RM1). The Inclined Lift costs RM2 each way. During my visit they were collecting donations for a further construction. The method of collection was quite novel. You were invited to write your name on a yellow Chinese roof tile for a fee and the roof tiles were set aside to be included in the construction in due course. 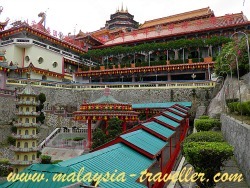 The location of the temple is marked on the map on my Top Penang Attractions page.From George Town just follow the signs for Air Itam. There is a car park inside the temple complex (not free).